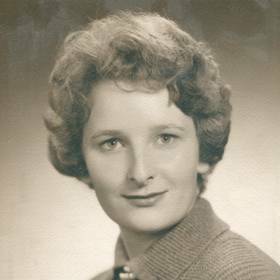 In many ways, Elaine Mevis defined the meaning of devoted wife, dedicated mother, and a woman devout in her faith. With ways all her own, Elaine’s generous and warmhearted spirit was an inspiration and gift to friends and strangers alike. She found joy in her Lord and in the family she so deeply loved, and although she could be stubborn at times, Elaine’s selfless nature was a testament to the way she lived by her convictions. Loved abundantly and cherished in the hearts of many, Elaine was a true blessing in the lives of those she leaves behind. By 1942, news of the day included the perils of war during World War II and the sacrifices of battle. In the U.S., young men not in uniform were often found dancing the jitterbug with their saddle-shoed sweethearts, or taking in a picture show like Cagney‘s, “Yankee Doodle Dandy”. Women entered the workforce in droves, and rationing was commonplace on the home front. Despite these changing times, along the shores of Lake Michigan in Milwaukee, Wisconsin, Jacob and Emma Kralovetz found cause for celebration on May 27, 1942 when they welcomed the birth of their little girl, Elaine. From meager beginnings, Elaine’s parents worked hard to begin their lives together in Kewaunee, Wisconsin. They cut and split enough firewood to fill four railroad cars and with the $100 they earned, they set out to begin their lives together. Their journey took them from Kewaunee to four other small towns in Wisconsin and with each move a new child was born. 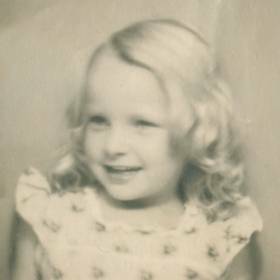 The youngest, Elaine was born in Milwaukee and was affectionately referred to as “Dolly” because she was "just a doll". Elaine grew up alongside her older siblings, Dolores, Arlene, Harvey and Carol Jean. For a time they lived on a farm located on Electric Avenue in Milwaukee, now near Miller Park. The very tree where young Elaine waited for the bus still stands to this day. On the farm everyone pitched in. Elaine’s chores included peeling potatoes and carrying water from the nearby well to do dishes. No easy task, her family used the well on a neighboring property because frogs had poisoned their well. Along with chilly trips to the outhouse, they had no heat in the upstairs of the farmhouse and they used layers of army blankets for warmth. From a young age, Elaine was no stranger to hard work. Along with her chores on the farm, she picked cabbage at the Prochaska’s farm for $.01 per head. Even so, Elaine enjoyed a childhood filled with adventure which included collecting worms with her siblings to sell for bait. Eventually Elaine’s family made one last move when they bought a house in the close community of Oak Creek. A likable girl, Elaine attended Christ Evangelical Lutheran Grade School before graduating from Racine Lutheran High School in 1960. Following high school Elaine began working at Johnson Candy Company in Milwaukee. With hopes and dreams for a family of her own one day, God’s timing was perfect when Elaine met her one and only, John Mevis after his car had a flat tire. The two began dating, love blossomed, and on April 15, 1961 they were joined in marriage, and Elaine could not have been happier. Elaine began working at Western Publishing in Racine where they printed the children’s line of “Golden Books”. Each day she took the north shore train which ran through the back yard of the home in Oak Creek. When Western Publishing closed, Elaine needed a job. An opportunity at AC Delco opened up, and Elaine vowed that if God gave her that job she would commit her first month’s salary to the Lord. Needless to say, He provided and Elaine kept her promise. She remained working at Delco until eventually retiring in 2005. Along with working, Elaine lovingly raised her family which came to include five children. Steve came along in 1963, and little Marshall was born in 1967, yet he sadly only lived a few short hours. Marty’s birth was celebrated in 1969, followed by Nicole in 1971. Jamie completed their family in 1973. Elaine made a good home for John and the kids. Her parents sold them the lot next door to the farm for a dollar, and they soon built a home of their own in Oak Creek. Shortly after getting married, Elaine and John attended Trinity Lutheran Church, yet their faith was soon changed when John’s friend invited him to Parkway Apostolic Church. When John was asked to repair Pastor Frank’s sump pump in the parsonage on a Sunday morning, it quickly resulted in John attending church that morning, as well. Elaine soon followed, and together they committed their lives to Christ. As a family they attended church on Sunday mornings and evenings, and on Wednesday nights, too. Elaine and John’s love and devotion to the Lord led to weekly bible studies and Friday prayer meetings, and in faith, they brought many people to the Lord. On Sunday nights after church there was always a gathering at the Mevis house with family and friends. Church was very important to Elaine and John, and Elaine made sure her children attended even after they grew up and moved out. If she didn’t see her family in Sunday services, she was sure to call them! Elaine and John served their church in many capacities. Along with close friend, Ed Suminski, they even began a business, Tree-ez. Providing firewood to local Milwaukee families, they each ran the business and worked their day jobs full time, using their profits to pay off their pledges to the Parkway church building fund. Elaine’s family was everything to her. A selfless woman, Elaine never took time for herself, and her greatest joy was bringing her children and grandchildren together for meals. Even in retirement she was always thinking of her grandkids. With her giving heart, no one left Elaine’s home empty handed. Many were welcomed to her home with open arms where they could find a place at her table. Over the years she even took in and adopted numerous stray cats, bunnies, and dogs. One of Elaine’s passions was her love for cooking and serving, especially large groups. There was always enough food on the stove to go around, and on many occasions, their home was open to those experiencing hard times. While she busily prepared food, John could be found teaching the gospel and together they witnessed God’s power for changing lives. A true prayer warrior, Elaine was always praying for someone or about something. There was only one true love in Elaine’s life, her beloved, John. When he was called home at the young age of 50 in 1992, Elaine went on to journey alone. The bar had been set, and no one could compare to her Johnny. For years, Elaine’s son, Jim tried coaxing her into a Florida vacation. She always put it off to, “next year”, but in 2014, Jim finally bought her a ticket and told her to pack her bags. She hadn’t flown in over 30 years, and once they landed in Tampa, Elaine was relaxing on the beach a few hours later. She so enjoyed standing in the ocean with the sand between her toes. In her free time Elaine found much contentment in her love for gardening and tending to her beautiful flowers. She loved preserving her harvest by canning fruits and vegetables, and she made the best salsa. Elaine also loved collecting rocks from family vacations to use in her landscaping. In fact, Elaine brought so many rocks back from a trip to California that the car needed a new transmission! When she watched TV, her favorite show was Monk, and when it came to music she loved listening to Bill Gaither, Elvis, Tom Jones, and worship songs. In the heart of Elaine Mevis, there was no greater love than the love she held for her Lord and family. She lived by example, serving her children and grandchildren well. Elaine always had an encouraging word, and through her nurturing faith she was truly devoted. Although deeply missed, Elaine leaves much to be remembered. 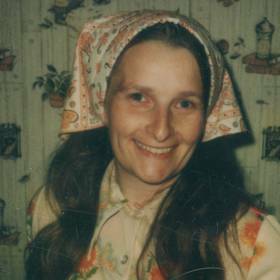 Elaine E. Mevis (nee Kralovetz). 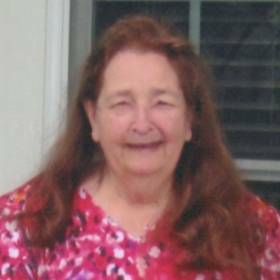 Age 73 of Oak Creek passed away on Wednesday, April 13, 2016. Elaine was preceded in death by her husband, John M., infant son, Marshall, infant grandson, John, and siblings, Dolores Smith, Arlene Lemke and Harvey Kralovetz. 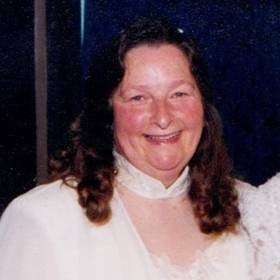 She was the cherished mother of Steven (Colette) Mevis, Martin (Mary) Mevis, Nicole (Daniel) Cortez, and Jamie (Katie) Mevis; loving grandmother of Clinton, Johnathan, Ryan, Wyatt, Logan, Morgan, Gavin, Adrianna, Christian, Danica, Meagan, Kelsea, and Caitlyn; dear sister of Carol Jean (Ron) Grundy; other relatives and friends. Visit with Elaine’s family on Monday, April 18, 2016 at Parkway Apostolic Church, 10940 S. Nicholson Rd. Oak Creek from 4:00 PM until the time of her funeral service at 7:00 PM. Private interment at Forest Hill Memorial Park. In lieu of flowers, memorials to Parkway Apostolic Church–Missions are appreciated. To share a favorite memory or photo of Elaine and to sign her online guest book, please visit www.SuminskiFuneralHome.com. Suminski Lifestory Funeral Home-Niemann/Suminski (414) 744-5156.